To be a wedding photographer proficient in wedding photojournalism, one has to be able to tell the story in the most compelling way in terms way composition and vision. To define the term photojournalistic wedding photography, Google interprets as "the art or practice of communicating news by photographs, especially in magazines." However, in my opinion, photojournalism especially in the wedding industry has to have a more defined terminology. Wedding photojournalistic photographs need to be not posed, not directed in any way, and of course need to have a story unfold. A simple candid picture would not count as photojournalistic. It needs to tell an in-depth story. As in this photograph, you can see there was more than one thing being told. 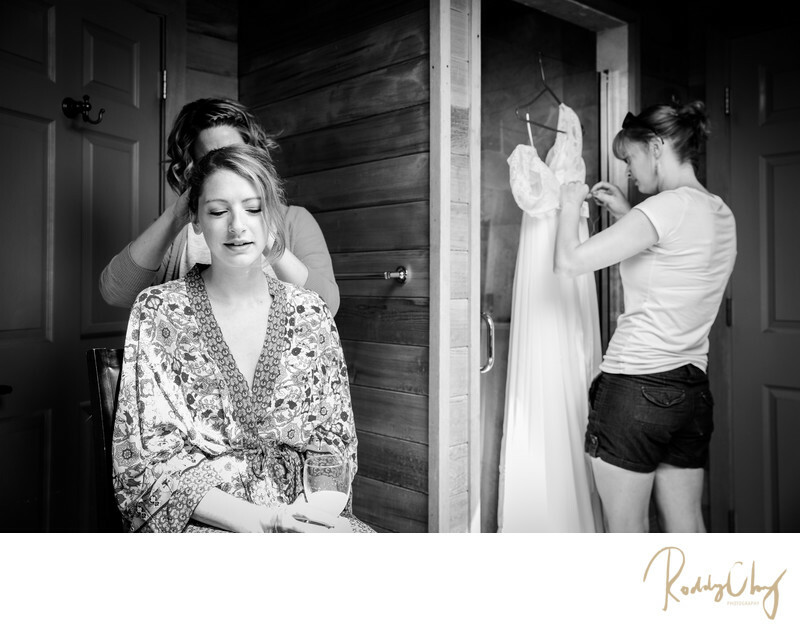 The bride is getting her hair done, while the bride's sister was fixing the dress. It conveys an event full of movements and messages. You feel the calmness in this wedding prep. You can get an understanding of a close relationship between the bride and her sister and the cares they have for each other. There were no any dramatic up and down emotion. The room was not filled with extreme excitement or anxiety, but an atmosphere with still and pleasant anticipation. Moreover, the composition of this photograph also help translate the the photograph in an nonconventional way.